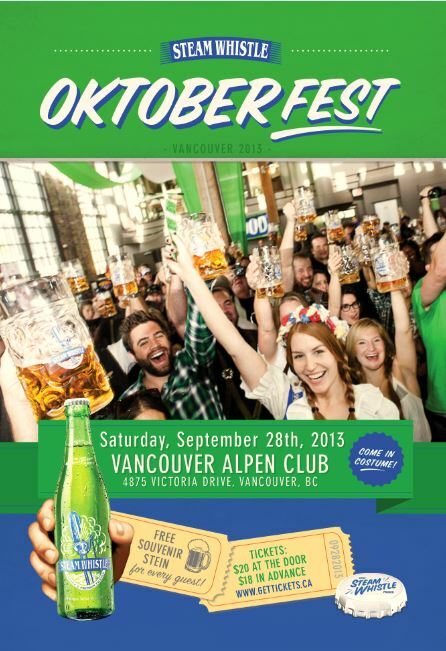 On September 28th, 2013 Steamwhistle out of Toronto Ontario held an Oktoberfest party at the Vancouver Alpen Club in Vancouver BC. Every person that attended received a free Steamwhistle Pilsner as well as a 1L stein to take home. The venue was set up as a long table hall like you would find in Germany for Oktoberfest. Tickets were only $18 witch is pretty good value! They had german food like schnitzel and German sausages for purchase. Beer was sold by the glass or the pitcher and beer was flying out of the taps! There was live entertainment and crowd participation during the eventing to liven up the celebration. There were a few issues like long lines for beer as there was only one bar and one barrel pouring but you got to know way more people. Overall it was a fun event and I hope that with a few more bars being open next year it will be that much better! Full Sized photos found here!